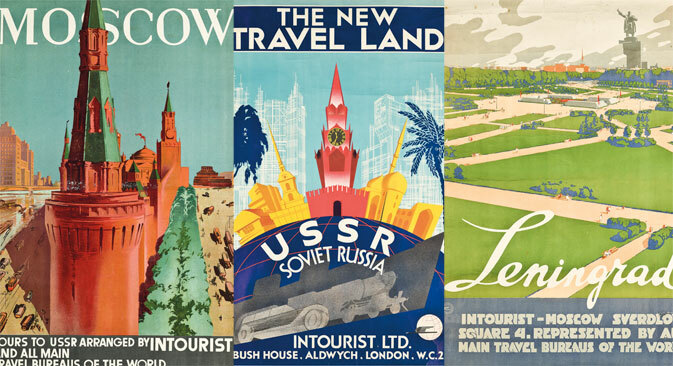 London auction house Christie's is presenting a sale on June 18 of Soviet posters from the 1930s that were made for Intourist, the state-owned travel agency (the name is short for International Tourist). This company's main role was to create a positive image of the Soviet Union as a travel destination for foreigners. These posters were all distributed for viewing by Western audiences and were quite different from ordinary Soviet posters used inside the country, with their stereotypical design. "Five posters on sale at this auction were created specially for distribution in Great Britain and they praise the Soviet Union as a 'new territory for tourism'," said Sophie Churcher, who is in charge of rare posters for Christie's. "One of the favourites in this selection is an advertisement for the Trans-siberian express (lot №155), the design of which was inspired by an art-deco style," she added.